When you decide to book a guided elk hunt, you not only need the desire to have a successful elk hunt but must be able to pay for such a hunt. Your best chances of success are on a guided hunt as you will be with a guide who knows the elk, the lay of the land and also how to find the bulls. You do pay the price but this will improve your chances of success. Hunting with an outfitter isn't what you would call cheap, so be prepared to pay the price. They can run into thousands of dollars. You have already made the choice to hire an outfitter, so now the fun begins. It is not all that easy to just hire a guide, you have to hire the right guide. You will be hiring the services of someone you do not know and have never met before. And to top it off, you will be sending that stranger a large chunk of money that is known as the "down payment". He more than likely isn't your neighbor, but lives a thousand miles away to boot. Yes, that can be a bit scary. It is just one of those necessary evils in life. Begin by first choosing a state that you wish to hunt in. Consider the size of the elk herds, the hunter success rate, as well as other big game you may wish to include on your hunt. You may wish to combine your elk hunt with a mule deer hunt , a whitetail hunt or even include bear with that hunt. Another factor may be how close you are to a particular state. You will have to decide also on what kind of hunt you are going to choose. There are four types of hunts to choose from. You have the bare bones, the drop camp, the standard hunt, and the deluxe package, the trophy hunt. The bare bones hunt will be the least expensive. You will generally given room and board and the outfitter will recommend places nearby to hunt, but you are on your own. And if you should get an elk be prepared to pay to have it taken out for you. For this type of hunt you must be prepared to hike miles and miles to get to where the elk are before sunrise. Also be prepared to go home empty handed as your chances for success are low. This is not much different from the self guided hunt except that you will pay more for this than you would for your self guided hunt. On the drop camp type , the outfitter will furnish an equipped backcountry camp, with tents, cooking utensils, and sometimes even food. The outfitter will take you to your backcountry home away from home, and shows you where you should begin your hunt, and leaves you to hunt on your own. He may have a guide stop by every other day or so to tend to any needs you may have, and to pack out your game for you. If you and your buddies have some knowledge of elk hunting, this is a very practical way to go as it is about half the price of the standard hunt. But you should realize that you will not have the experience of the guide with you. You will generally be back far enough that you will be away from other hunters though. And after your long hard days , when you return to camp, you will have to do your own chores. You will have to locate the elk on your own, and should you score, you will have to be the one to field-dress the elk, quarter it and pack it back to camp so you can then hang it. The standard hunt is what most hunters go with. With this the outfitter will furnish you with a guide, generally one guide for every two hunters. All packing, camp chores, and field care of the elk are taken care of for you. All you should need to furnish is your gun, ammo, and clothing, and a sleeping bag. This type of hunt has a big advantage in that everything is furnished for you. Add to that , the benefit of having a guide with you. It will cost you over a thousand dollars. You will not have the guide all to yourself, so if you see only one elk within range, it may not be your day to shoot. The trophy hunt is for the hunter who has specific requirements as to the size of the elk he wants, such as a big 6x6 bull. He may also require that it be of a minimal Boone & Crockett points. The trophy hunter will more than likely have more physical demands put on him also. The guide will take him far into the remote areas, away from all the other cows and smaller bulls. He must be prepare to leave without his elk , even though he has paid all that money for his trophy. 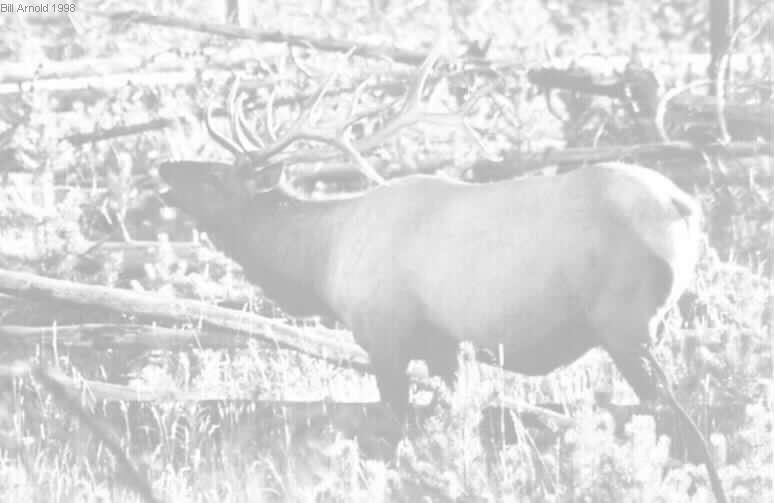 Those big trophy elk do not get that way by being out in the open with the smaller bulls. They are in their little hiding areas where you will have to work hard to find them. Do not just pick an outfitter out of the magazines. Contact several outfitters, and find out about the accommodations, hunter success, the area, and the price. Ask questions of each one, and lots of questions, until you are satisfied with all the answers and know exactly what it is that you are going to get for your money. Get a list of past clients for referral and contact them about their hunts. Check with the state that you choose about particular outfitters. Some may promise you everything and you may end up with a bad hunt. I am not saying that all outfitters are bad, but there are some that are less desirable than others. When asking about the hunter success rate, find out how many were bulls, cows, spikes. How many of those bulls were big bulls, 5x5, or 6x6. Were they small 5x and 6x, or were they mature. It is your money and you have the right to know what you can expect for it. A good, reputable outfitter will have no problems giving you the answers to you questions. Ask how many hunters are for each guide also. Do not just find out through the mail, pick up the phone and talk to him personally and get to know him a little. Find out what you can expect from him and find out what he expects from you as well. He is not going to want to take you on a hunt if you are run down and in poor physical condition. You have a responsibility to the guide and outfitter, just as they have responsibilities for you. This is your responsibility not only as a person, but as a hunter.